With much of his cuisine inspired by the cajun flair of Louisiana, Lagasse saw this as a once-in-a-lifetime opportunity. “I’ve developed restaurants all over the country, but to create my first restaurant at sea—on a ship named Mardi Gras with its own French Quarter, no less—was an opportunity I simply could not pass up,” says Lagasse. The menu of the new eatery will include classics like oyster po-boys, along with gourmet takes on classics such as a roasted duck gumbo. This eatery will offer unique breakfast options as well, with savory choices, such as a shrimp Creole omelet, and sweet treats like Bananas Foster. Carnival’s Mardi Gras will set sail in 2020, and she is slated to have some of the best cuisine on any Carnival ship to date. With new restaurants, including Shaq’s Big Chicken and Emeril’s Bistro, space will fill up quickly. 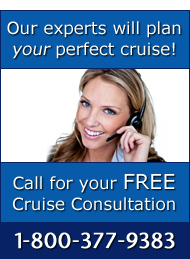 Call The Cruise Web today at 1-800-377-9383 to speak with one of our expert consultants about your next cruise on Carnival! We were excited to see Carnival offering a new 16 day cruise leaving New York for the North Atlantic on June 3, 2020. Stops to include Greenland, Iceland, the Shetland Islands, N. Ireland and Cork Ireland disembarking at Dover. It really sounded perfect for us, but our travel agent cannot get us booked. Strange! Hi, Gerald. That is an incredible itinerary! It looks like you’ve working with Trevor here at The Cruise Web before. I let him know that you were interested in this sailing and he should be getting in contact with you in the next day or so. If you would like to reach him directly, please call 1-800-377-9383, extension 428. Hopefully we can get you on that sailing!